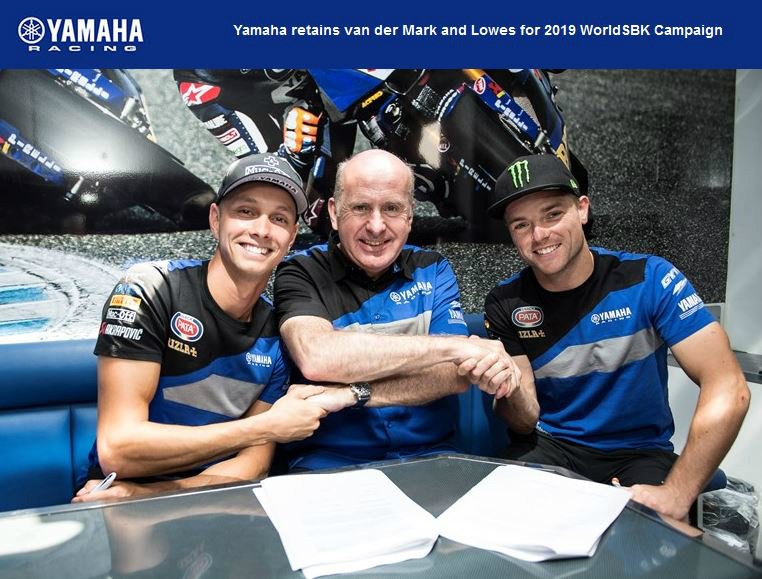 Michael van der Mark and Alex Lowes will again lead Yamaha's assault on the FIM Superbike World Championship in 2019, after the two riders agreed terms with Yamaha Motor Europe during the recent Misano race weekend. The 2019 season will be van der Mark's third in Yamaha colours. The former European Superstock and FIM World Supersport champion secured two podium finishes during his debut season aboard the Yamaha YZF-R1 in 2017, an achievement he has already surpassed in 2018. The 25-year-old Dutch rider has finished on the podium seven times already during the first half of the 2018 season, including a career first WorldSBK win in Race 1 at Donington Park. Van der Mark then went on to take victory in Race 2 at the British round to secure his first double win during what was his most successful WorldSBK event to date. Van der Mark currently lies third in the 2018 championship standings with 248 points. Van der Mark has also enjoyed success at the Suzuka 8 Hour endurance race, winning on three of the five occasions he's contested the race, with his last victory coming in 2017 when he rode for the Yamaha Factory Racing Team alongside Lowes and Katsuyuki Nakasuga. For Lowes the 2019 season will be his fourth with Yamaha's official WorldSBK team, of which he's been an integral part since Yamaha made their official return to the FIM Superbike World Championship in 2016. The 27-year-old British rider has secured seven podium finishes for Yamaha since the start of the 2017 season, including a first race win at this year's Czech Republic round in Brno. Lowes currently lies equal fifth in the 2018 championship standings with 193 points. The former British Superbike Champion is also a two-time winner of the prestigious Suzuka 8 Hour endurance race, having taken back-to-back victories for Yamaha in 2016 and 2017. Having secured their rider line-up for the 2019 season, Yamaha's official WorldSBK team is fully motivated to return to action after the summer break, for Round 10 of the 2018 MOTUL FIM Superbike World Championship at the Algarve International Circuit in Portimão, Portugal, which takes place from 14-16 September.